Mommy to 6 perfect kids... Grandma to 8 beautiful babies and wife to one wonderful man! crafts... crafts... and more crafts! 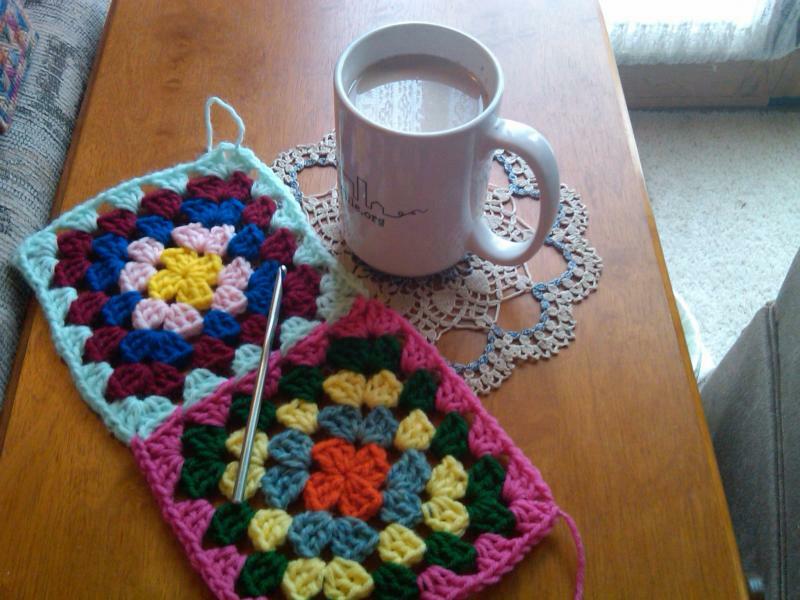 I love Crocheting and Knitting... they are most relaxing. My Aunt taught me when I was about 6-7 yrs old. Good Morning everyone..... hope this day finds you well! Have some errands to run... then home to work on my flower seed business... then relax with my hook and yarn! Its going to be a hot one today... already 80* here. So indoors it is for this old lady! have a great day!!!! That is so cool! LOVE IT!​ Thank you!!! It feels good to be here! Missed you guys a lot!!! Thanks everyone! This is actually the second one I have made for this same friend! She loves this blanket design for boy babies. aww.... thanks everyone!!! Let me find the pattern in my things and I'll post it! I'm a little foggy these days. my mom loved her new sweater! Made this for a friend who wanted it for a gift! My favorite little "go to" bag pattern!!! !